Never trust a Thai person, I tell myself. Although, that’s harsh because Thai people aren’t necessary untrustworthy. The problem many times is some Thais aren’t patient enough with a volunteers’ language skills. Ever see someone who doesn’t speak good English and the person they’re talking to agrees with everything they say only in hopes of ending the awkward conversation sooner? That’s me and about 100 other volunteers in Thailand, except it’s Thai we can’t speak fluently. It’s not never trust a Thai person; it’s confirm serious decisions twice and if you have a bad feeling, go with it and get out of the situation. If the best way to learn something is the hard way, then I’m doing well. I knew what bus station to go to, so I don’t know why I asked the manager of my guesthouse where to go. I told him I was going to Sangkha and he told me a different bus station I thought I had to go to. I trusted him – mistake No. 1. When I got to the station I told a woman standing outside who worked there I wanted to go to Sangkha. She directed me to window No. 84 inside. When I told the woman at the window I wanted to go to Sangkha, she told me the bus would take me somewhere I couldn’t understand and then I’d have to take another bus to Sangkha and it left in 5 minutes. The other time I went to Sangkha, the bus went right into the city from Bangkok. Then she only charged me 120 baht, which was strange as well. I was getting a bad feeling. When I finally got on the bus I asked an attendant if the bus went to Sangkha. She said yes, but it seemed as though she were simply agreeing to end the conversation. I went back to my bag and got a map of Thailand and pointed to Sangkha and asked again if the bus went there. Yes, she said it did. Sangkha is seven hours east and north of Bangkok. The bus went to Kanchanaburi, an hour and a half west of Bangkok. How did this happen? I’m still not sure, but I think there must be a city called Sangkha near there. From when I talked to the guesthouse manager the problem just snowballed. Why did the woman on the bus tell me the bus went to Sangkha after I pointed to it on a map? I DON’T KNOW, but if I’m ever a bus attendant in the states and she’s there, I hope to send her to Bismark from Minneapolis when she wants to go to Chicago. I stood here and people watched while listening to Nirvana's In Utero on my iPod. The blur is pretty much what I saw through my anger at myself and the bus attendant. Lesson learned: If you don’t need help, don’t ask for it. On my bus rides from Surin to Sangkha, I would always get off the bus and then take a truck/taxi to my village. However, whenever I got off the bus, I saw it went in the same direction as my village. One Sunday afternoon I was on the bus and asked the attendant if the bus went to Thepraksa, my village. He nodded his head. I had already learned not to trust the head nod. It usually means, I can’t understand you. Perhaps if I look like I do, you’ll stop talking to me. So I asked him again and this time he said, yes. I still wasn’t convinced after my nightmare out of Bangkok, although if I went in the wrong direction this time, at least I’m still somewhat close to my home. 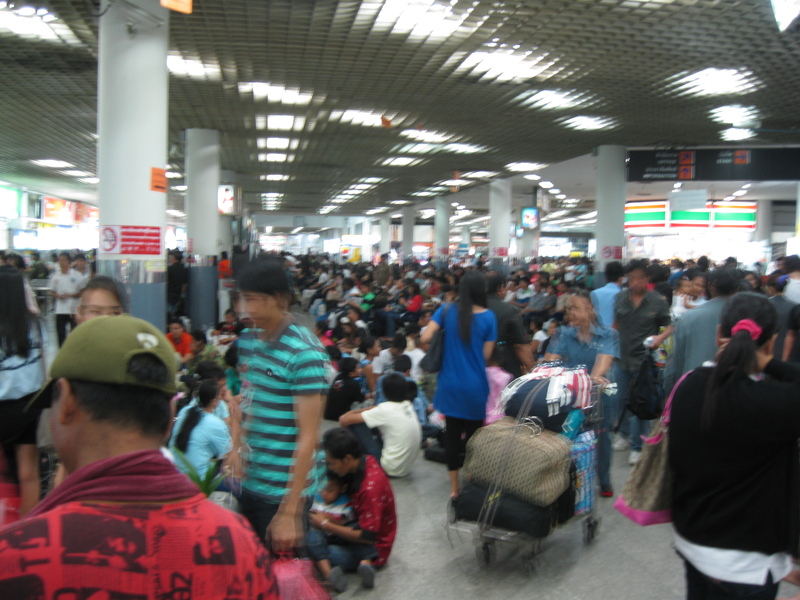 I sat here for a while after finally returning to the Bangkok NORTHERN bus terminal. When we got into Sangkha I asked him again and this time I got a thumbs up and, “Chai, chai, chai!” which means correct. As the bus reached the fork in the road that leads to either my village or unknown territory, it went left into the unknown. At this point I’m three miles from my house. I thought of telling the driver to stop and I’d walk from there, but I didn’t – mistake. I asked the attendant again if it went to my village and he said, “Chai!” I thought the road would wrap around a way I hadn’t been before. I took my GPS out of my bag to see how close I was to home. It wouldn’t work. Finally the bus stopped in another city and everyone but me, the attendant and the driver got out. Not good. Another few kilometers down the road the bus turns around and stops near a home. The driver shuts off the engine and gets off. Thepraksa!!! Thepraksa!!! How many times do I have to tell you???!!! Those were my thoughts. My GPS finally got reception and I found I was eight miles from home. Luckily, there was someone willing to give me a ride from there and I directed the way home. This seemed to finally convince him and he drove the extra two minutes and dropped me off. Lesson learned: Never trust a Tha…I mean, get off in Sangkha from Surin. It was a long, long Saturday night and I wasn’t feeling the greatest Sunday morning. I wanted to get out of Surin as soon as possible. I found the street with the van back to Sangkha. I asked one of the drivers if his van went to Sangkha. He nodded and opened his door. I got in – mistake. After waiting in the van for 20 minutes, it made its way on the route I’m used to on the ride home. I even asked the guy sitting next to me if the van went to Sangkha and he nodded. Never trust the nod. As it approached the main highway to go to Sangkha, it turned left. After the previous two incidents, I knew enough to get out of the situation quickly. “Stop! Stop!” I said in Thai. I gave no courtesy smile on this one. I told the driver I wanted to go to Sangkha. Some polite women who’d just gotten on smiled and told me that the van didn’t go to Sangkha. 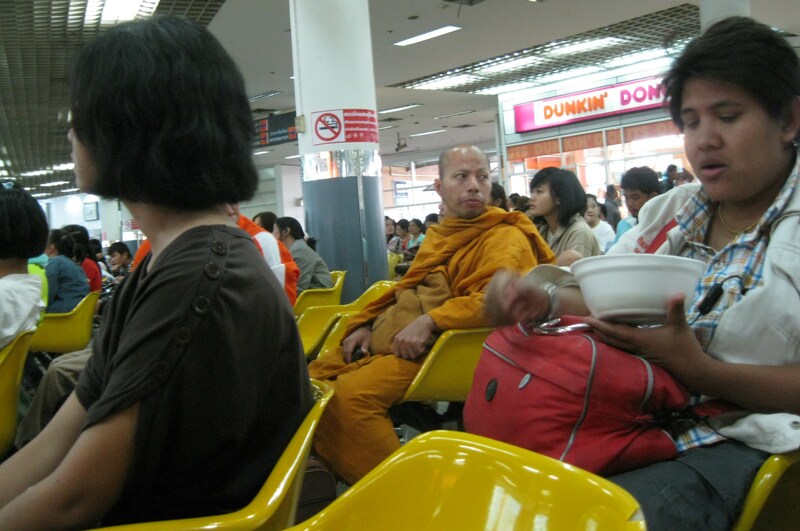 I didn’t give the guy a baht. I walked away, got a tuk-tuk back to the street on got on the correct van. Lesson learned: Don’t ask yes-no questions. It makes it that much easier for them to just say yes instead of actually hearing what you said. Ask them, “Where are you going?” When they tell you, repeat what they said to confirm it. Final lesson learned: Trust yourself and know who to trust. This entry was posted in Peace Corps and tagged bangkok, buses, peace corps, thailand by Jeff Jackson. Bookmark the permalink. I like the irony of listening to Nirvana in Buddhaland when you’re about as far away from nirvana as you can get. Just to clear up some confusion, there is a city past the amphur in Kanchanaburi called Sangkhla Buri and everyone just calls it Sangkhla. Sounds about the same 🙂 I’m sure that was the mix up. Sounds like you had a crazy trip!